Vegas Crest Casino no Deposit Bonus Codes 2019 - Get 20 Free Spins! Launched in 2014, Vegas Crest Casino entered the online gambling scene with a splash that continues to draw players to its virtual doors. The site delivers an impressive selection of game titles, perhaps because it is powered by such big software players as Rival, Betsoft, Saucify, and Vista Gaming, delivering exceptional variety. Despite the fact that the casino caters to members from numerous countries, it is only presented in English, which can be disappointing for some players. Its name is well-deserved since the casino presents a Vegas theme with all of the glitz and color you might expect from a trip to Las Vegas. 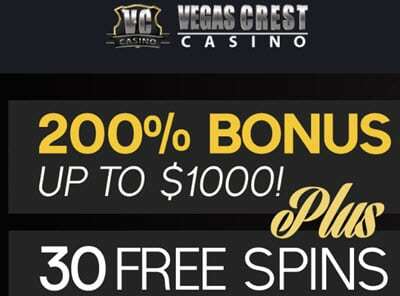 Welcome packages, generous perks, and superior member support round out the benefits offered by Vegas Crest Casino. Deposit Bonus: 200% up to $1000 Plus 30 Free spins! VEGAS CREST CASINO play now ! Before you make up your mind if you want to join this casino, take a look at what it has to offer. The site looks as though it offers an appealing spot to enjoy gambling, but players should make up their own mind using available information. Here is a list of the advantages and disadvantages of joining Vegas Crest Casino. Part of winning huge payouts involves the ability to find and optimize the bonuses and promotions offered at the casino. It's easy to find these offers on the casino's website, but here is a look at what you can expect to find. The welcome bonus is worth a look, particularly if you intend to join the casino no matter what. It is a bit unusual compared to what most casinos offer. The bonus is generous with as many as 100 free spins and up to $2500 in funds, but the way it is broken down is confusing at first glance. Players must start at The Tipsy Tourist to enjoy their initial ten free spins and move to Pinocchio for their first deposit and a 200% bonus and up to $1000 in funds as well as thirty free spins. Both of these games are Betsoft slots that many players should know. The second deposit takes you to the Fruit Zen 3D slot game and a bonus of 300% bonus and up to $1500 in funds as well as sixty free spins. Each day, a bonus is offered on a player's initial deposit, providing access to match bonuses that vary according to how much money you put into your account. Just click on the promotion link on the home page to see what options you have. If you visit Vegas Crest Casino frequently, you can enjoy VIP status. The entry point for VIP membership requires a player to earn at least 100,000 comp points each month. Keeping up with existing trends, Vegas Crest Casino offers on-the-go gaming with clear graphics, perfect audio, and ready access. Members can enjoy gaming from the comfort of any location. Vegas Crest Casino offers a huge collection of games, drawing in a wide grouping of players. This online casino provides slots, table games, video poker, scratch cards, Bingo, and Keno. Members have access to all of the traditional titles along with quite a few modern ones. The site continues to grow and so do the jackpots. While new members are at the greatest disadvantage upon joining a new casino, anyone can experience the need to ask a question or two. Vegas Crest Casino offers ready access to its support staff through live chat, phone, and email. Quick solutions for any gaming issue are never difficult to find. New members will discover registration is easy to complete. Just look for the registration button on the home page and fill in the form with the requested information. It's best to figure out the username and password you would like to use prior to clicking on the registration button located on your screen. Of course, you need to provide a few personal details such as your location and contact information. Once you do so, the next step is to agree to the rules and regulations presented by Vegas Crest Casino.